Sometimes we do take things in our own backyard for granted. We constantly hear about and are quick to know all about bad things: lousy service, sucky experiences and what-have-yous…funny how bad news travel faster than good huh? Joining the recent Malaysia Airports Berhad (MAB) media fam tour of Kuala Lumpur International Airport (KLIA) proved insightful. I went out of sheer curiosity but happily, I depart from the tour brimming with new, useful information and invaluable enriching experiences worth sharing with other avid travellers. Wanna travel like a VIP? Dream of being whisk through KLIA like a diva? Now, KLIA Premier Access can make it happen. Just purchase your Priority Access Pass – it’s the ‘magic carpet’ to whisk you through MINUS the usual hassle every ordinary Ahmad, Ah Chong and Samy has to undergo, starting from the airport kerbside up to your boarding gate in supersonic quick time. You can either pre-buy the Priority Access Pass (refer to above chart for rates) in advance or upon arrival at KLIA, head over to the counter (shown above) to purchase. Premier Rate Access is ideal for travellers who are pressed for time, the old and infirm or families with young children as they are accorded Meet & Greet service and buggy service. The Premier Access Pass also gives you entry into the KLIA Premier Lounge. Similar to an airline lounge, you can enjoy coffee/tea, refreshments and standard lounge facilities here. Travelling with oversized luggage? Want to explore KLIA without pushing a laden trolley of baggage? You can approach the Porter Service counter for help. Different rates are applicable for the Porter Service, so feel free to ask the guys on duty. I bet many of you have seen this patch of lush greenery at the centre core of the Satellite Building. There’s even a recreational walkway and manmade waterfall through the verdant space housing the original forest reserve that has existed before the Satellite Building was built. Best of all, you can walk through the Jungle Broadwalk FREE of charge! This natural forest reserve is the epitome of KLIA’s 'Airport In The Forest, Forest In The Airport' concept, offering passengers the refreshing experience of walking through a tropical forest reserve. There’s also a Circular Viewing Gallery at the Mezzanine Level. KLIA now has 10 shuttle bus services as another mode of people mover between the main terminal and satellite building in addition to the Aerotrain services. The shuttle bus service is available 24 hours daily and only takes 5 minutes to transport passengers between the main building to the satellite terminal. The clean and comfortable bus interior is also adorned with traditional motifs and highlight informative snippets of local crafts like Perak's labu sayong. MAHB General Manager, Corporate Communications Nik Anis Nik Zakaria also led us to view the VVIP lounge – a rare chance for us to view the plush space where visiting heads of states and those in the highest echelons of power wait or convene prior and after their scheduled flights. Refresh, Relax and Renew is the tagline for Sama-Sama Express Hotel, the 80-room airside property caters to transit passengers. Located at the satellite building inside KLIA, Sama-Sama Express boasts a spacious, cosy lounge with complimentary welcome drink at check-in. Shower facilities are available for guests who wish to freshen up after a long haul flight. The use of lounge and shower facilities start from RM45 per person. Complimentary Wi-Fi and internet facilities keep guests well connected while anyone needing to use a last minute meeting room can rent one at Sama-Sama Express at RM320 upwards. For layovers between flights, travellers can check-in to a Deluxe room or Suite for 6 or 12 hours from RM265 onwards. Feel peckish? Food & beverage such as the chef's much lauded sup daging and biryani should warm the tummy alongside sandwiches, salads and assorted dessert. There's a huge signboard visible to travellers in the arrival/departure hall so a stopover at Sama-Sama Express is super convenient. Sama-Sama Express also provides frequent buggy shuttle service so just press the intercom button shown for instant response. Three (3) minutes. That is the target response time the Airport Fire & Rescue Service (AFRS) team strives to meet in case there’s fire, aircraft accident, hazardous spillage on the runway or any other emergency occurring at KLIA. priority is to save lives in emergency cases. The team also provides fire-fighting service, guides stakeholders on fire prevention and renders medical first-aid instantly in emergency incidents. We even had the rare chance of riding in one of the Rosenbauer 8x8 Aircraft Rescue Fire Fighting vehicle – the world’s most advance aircraft firefighting vehicle. 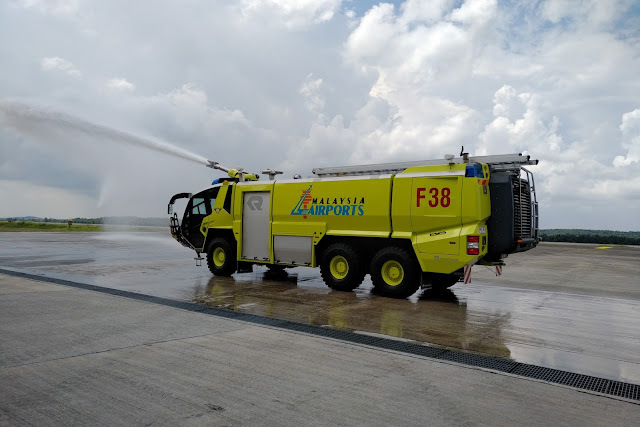 Yes, folks KLIA has 2 of them including the Rosenbauer model used in the blockbuster "Transformers: Dark of the Moon" movie! We must salute these brave men who keep watch on the safety of KLIA as the job is a taxing and highly demanding one, especially when it comes to the crunch. It’s also heartening to know KLIA isn’t resting on its laurels as various airport facilities are continuously upgraded over time. For instance, Muslim travellers from around the world will be the first to commend and appreciate the spacious prayer rooms, separate for men and women Muslim travellers. Prayer mats and robes as well as ablution area are provided for the convenience of Muslim travellers. For the general public, airport users and frequent travellers, many of the existing restrooms have been given a facelift. They look much nicer and warmly lit, with new hand dryers and all the basic essentials so we can only hope users will treat the facilities well. @kak gojes...terima kasih banyak-banyak atas pujian kak. KLIA memang cantik dan setanding airport antarabangsa lain.